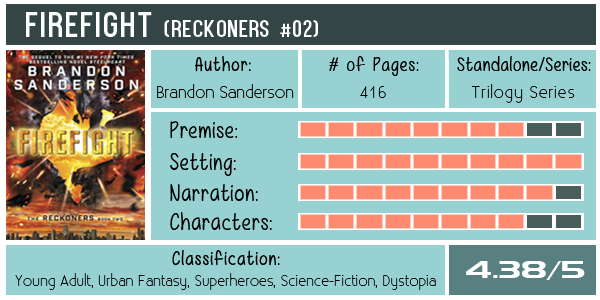 [Review] Firefight – Brandon Sanderson | thoughts and afterthoughts. Babylon Restored, the old borough of Manhattan, has possibilities, though. Ruled by the mysterious High Epic, Regalia, David is sure Babylon Restored will lead him to what he needs to find. And while entering another city oppressed by a High Epic despot is a gamble, David’s willing to risk it. Because killing Steelheart left a hole in David’s heart. A hole where his thirst for vengeance once lived. Somehow, he filled that hole with another Epic–Firefight. And he’s willing to go on a quest darker, and more dangerous even, than the fight against Steelheart to find her, and to get his answers. – The world-building is pretty darn creative—it beats the setting in Steelheart if I’m being honest—with plenty of imaginative detailing that continues to exude a cinematic feel. Basically: more epics, more metaphors, more awesome. – Fast-paced read driven by continual action and atmospheric tension in exploring an unfamiliar landscape even while delving into Phaedrus’ and Firefight’s back story. – While some minor characters are difficult to connect to, David’s progression of growth remains solid and can be easily rooted for (assuming you can stomach his bad metaphors). It was Boxing Day. There were ordinary sales and satisfactory crowds. Into Indigo I go. Paperbacks, hardcovers, Firefight, Moleskins. Moving on—wait, wtf, huh, why is it out so—?!!?! Seriously though, thanks to Indigo for selling this book early. It made this shopping day well worth the crowded mess in malls. Quotes will not be included in this review until well after the release date—which is tomorrow, January 6, 2015—so go ahead and get yourself a copy. Dude…Firefight was one heck of a ride. While Steelheart was incredibly fun, this sequel hits the notes of being both amazing and a letdown for minor reasons. But I’m still giving it 4.5 stars—what the heck, right? It’s the unexpectedness in conflict that makes this follow-up a worthwhile middle book [to a trilogy] that doesn’t falter at suffering from second book syndrome. That being said, it isn’t entirely surprising to see where plot points may be brewing but it’s the value added finesse in world building that makes this read exciting to continue investing into. Firefight combats new character archetypes in unfamiliar territories and heightens the thematic questions developed in the first installment of The Reckoners Series—all which set the stage nicely for the final novel…that I need…now. David Charleston is the reputable Steelslayer of Newcago; a title which brings him a wealth of trouble wherever he goes. David continues his work alongside Prof and The Reckoners in keeping his city safe but part of him believes in something more, something good within epics that doesn’t have to end in death. He just has to find it, and Megan, too. But the onslaught of epics appearing in Newcago to challenge the Steelslayer doesn’t let up. Then they catch wind of an epic residing in Babylon Restored (Manhattan) who might be behind the attacks and have the answers David wants to know. And one of them is Firefight. If you’ve seen this statement once, you’ve seen it a thousand times: Sanderson does pacing, magic systems, and world-building very well. Firefight was completely engrossing with its quick pacing and continual action that left little room to relax. The sequel reaffirms that with the proper setting hook in depicting a creative and nuanced world, everything else falls into place that much easier. Newcago was cool—epic even—but somehow I really appreciated the peculiarness of Babylon Restored (or Babilar). It takes the appeal of Manhattan high-rises with added grungy flair and stereotyped characters from neighbourhoods like Harlem or East/West Villages and elevates them (literally) by submerging the borough in water. Unlike Newcago, people seem to genuinely enjoy their way of life alongside the glow of iridescent graffiti and mysterious fruit bearing jungles that grow inside worn buildings. Or perhaps they make the most of it while they’re still alive. The ruling epic, Regalia, is of a different breed than what David and The Reckoners have endured under Steelheart, and it is the unknowns in Regalia’s ambition that creates a rift in communication between David and his comrades. But is Babilar really that different than Newcago? By obscuring the villain as someone who’s revered as a hero rather than an epic who rules by strength alone begs the question of whether or not a baddie is more fearsome if they flash a smile or two while they doing bad deeds or if they remain stoic throughout. David is much more solid in Firefight than he was in the first novel and a lot of that revolves around his awareness of himself and his relationships. As a newbie Reckoner during Steelheart, there was a learning curve in communication, team dynamics, and competency. But that was because they had aligned goals. In Firefight, there’s a divergence in ambition that creates tension between David and his colleagues. David’s narration doesn’t suffer from immediate changes in growth that typically latch onto doom-and-gloom many protagonists undergo in second installments. He takes conflicting interests in stride to balance out the unnerving questions and new emotions that seem to guide him toward a different perspective—one that isn’t regarded highly by Phaedrus. In many ways, David’s progression in growth [for the short time since Steelheart] is great; except for maybe his physical competency. I’m not completely sold on that one yet. Then there’s the part of his personality where he still continually tries to conjure his shoddy metaphors wherever he can. What I should say is that its returns are diminishing. Some are still hilariously bad and straight-up cheesy but you can’t help but think that some of the metaphorical dialogue feels rather forced. Sure, it’s probably part of his eccentric personality and was questionably cute at first; perhaps different than most protagonists, but it’s a bit overbearing now. But alas, praise the higher power that Firefight puts him in his place regarding his metaphors! You’ll understand why after reading Firefight. Otherwise, David is a character that I’m enjoying more and more and can easily connect with (aside from the obvious) while he continues to do his protagonist things. On the flipside, I did have a hard time connecting with some of the minor characters. While I understood their ambitions, the revelations were a tad lacklustre for me to really care a great deal. That being said, when I comparatively assess these new voices to Cody and Abraham, or even Nightwielder, they don’t hold up as more than simply pawns. What I did appreciate was the diversity in colourful characters being written. I also quite enjoyed the exploration into the bit of Phaedrus’ past and his conflicting interests of being an epic himself. There are several more epics thrown into the whirlwind journey who I should mention are all imaginative and have their moments of spotlight. I’ll leave the exploration of these characters to you—just know that they’re all pretty rad. The conclusion to Firefight is blockbuster material. The buildup leading to the pivotal moment is one that readers may love-to-hate for different reasons (re: BECAUSE THE WAIT IS TWO YEARS UNTIL THE NEXT BOOK—IS THIS REAL LIFE?!) but it isn’t sudden, unjustified, or panders toward something it isn’t. Sanderson continues to tinker with the core themes through his mosaic of characters and while there may be shortcomings to skeptical reading in revelations, Firefight is as enthralling a read as Steelheart and opens the door to Calamity’s conclusion of epic proportions. And whether or not Sanderson intended to or not, he elicited various expletive-laden reactions out of me—so kudos to that. Ah! I’m so excited for Calamity!